One often forgets the amount of work that was required to prepare a map in centuries past and this example illustrates the craft of copper-engraving as a method by which maps were drawn. The copper plate was engraved as a mirror image to prepare for printing…and the craftsmanship was down to highly skilled engravers. The results were often highly illustrative. Here, Johann Jakob Scheuchzer prepared a beautiful map of the landscape of Toggenburg district, St. Gallen Canton. It shows the location of major topographic features such as cities and towns but the map belies the continuous religious strife that engulfed the area in the fifteenth to eighteenth centuries. What it does do is present the mountains as an illusive and highly symbolic, almost mythical element of the natural landscape. The reasons for such a representation were to give a sense of place to the home of ‘dragon sightings’ catalogued extensively by Scheuchzer in the early 1700s. The marriage of mythology and copper plate artistry creates a magical picture of the dramatic mountainscape. 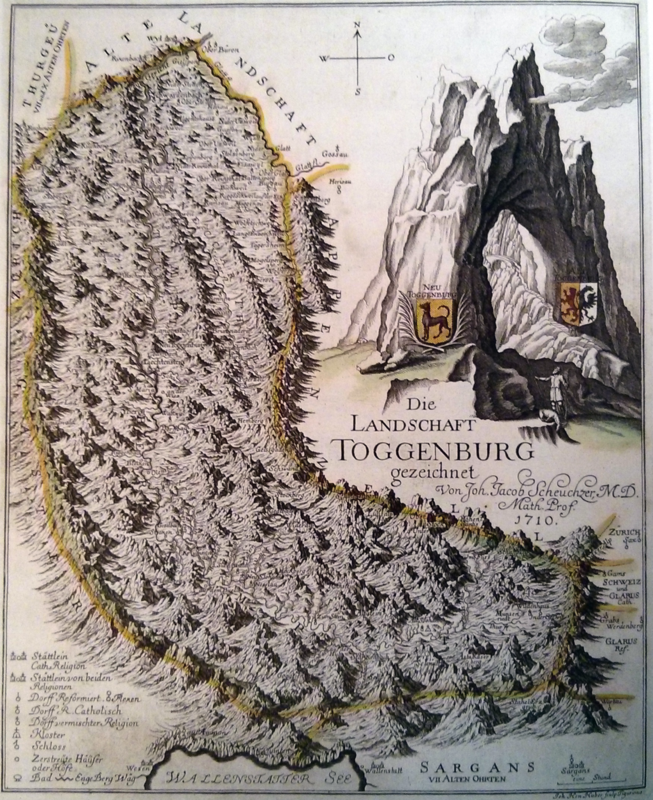 This entry was posted in MapCarte and tagged historical, illustrative, MapCarte, topographic by @kennethfield. Bookmark the permalink.